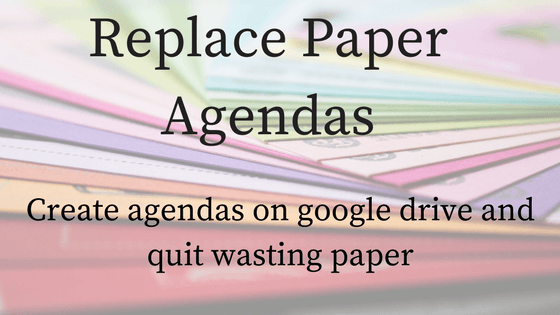 Replace paper agendas with electronic agendas on google drive. By creating a folder in drive called “agendas” and then giving each agenda a title like “March ‘17 Soccer Board Agenda” you can keep a running record of all of your meeting agendas. Better yet, you don’t have to print them out and distribute them. Even better, all of your board members can pull up the agenda on their personal device, whenever they want. Need to add and agenda item at the last minute? just edit the document, have all board members refresh their screen or app and BOOM, the agenda is updated and everyone has the most recent version. If someone demands a paper agenda it is up to them to print it off prior to the meeting and bring it with them. If the secretary or clerk is keeping notes or minutes, have them create a new doc called March ‘17 Soccer Board Minutes in the same folder. Better yet, have them take minutes on the agenda doc and you have both in the same document. Anyone with permission to read the doc can see who made each edit or change. If allowed, anyone with permission can add the document IN REAL TIME during the meeting. There is no need for the club secretary to go home, type up the minutes, and email them back out to the board. It all happens right there in the agenda doc on google drive. © 2016 Counting Coup, LLC All rights reserved.